Koreans in Japan have become a vocal minority that is challenging conventional attitudes about citizenship and identity. In statements to the United Nations and the media, Japanese leaders have routinely maintained that their island nation is a homogeneous country, inherently free of racial and ethnic discrimination. But among its 127 million residents are about 625,000 Korean nationals—Koreans by descent, if not birth, who, because of their ethnic heritage, aren’t granted automatic citizenship. Spanning four generations, they represent the largest minority group in Japan, although they are all but indistinguishable from Japanese citizens. Most were born and raised in Japan, have never been to their “homeland,” don’t speak Korean, and use Japanese names in their daily lives. Koreans in Japan may be able to pass as Japanese, but they do not enjoy the same rights, simply because in that country, as in some European ones, citizenship is based on principles of descent. The difference, though, is that in most European countries, the descent citizenship requirement doesn’t typically go beyond second-generation immigrants, while in Japan, even those three and four generations removed from their foreign descent are not Japanese citizens at birth. Japan’s historically strict naturalization practices have eased considerably in the last 20 years, so that now about 10,000 Koreans a year are becoming citizens. But why aren’t the rest of them doing so, and why aren’t Korean activists encouraging naturalization? The answer, posits Assistant Professor of Political Science Erin Aeran Chung, is that if they did, they’d disappear. “Their Korean citizenship is the last vestige of their Korean identity,” says Chung, the inaugural recipient of the Charles D. Miller Professorship in East Asian Politics. “When they give that up, they’re choosing to be Japanese and thereby lose any political power they might have had as Koreans living in Japan.” Indeed, Korean activists have focused their efforts not on naturalizing but on gaining rights and recognition as foreign citizens. In other words, they stand apart so that they may be heard. 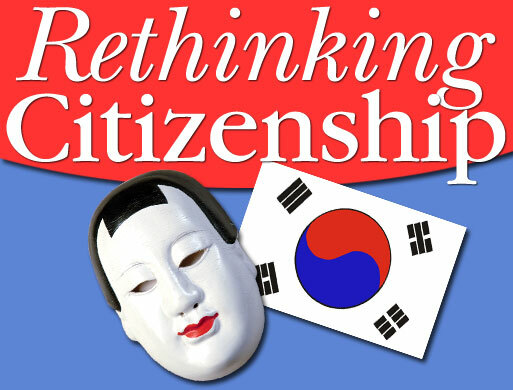 In doing so, Chung says, Koreans in Japan have amassed a level of political power not warranted by their numbers alone, and as they work at the edges of Japanese government to carve out rights for themselves and other minority groups, they are challenging the very definition of citizenship in Japan. Chung’s interest in politics began in her childhood, thanks in part to her father, a politically active academic who took a teaching job that returned the family from the United States to their native Korea in the 1980s. Living and attending school near Yonsei University in Seoul, Chung witnessed frequent student demonstrations, sometimes walking through drifting tear gas released to disperse students protesting alleged human rights violations by the country’s administration. “That experience was the reason I started studying politics in general, and the reason for my interest in Korean politics,” Chung says. In her undergraduate years—back in America—she looked at the effects of Japanese colonialism on South Korea, and in her master’s program, she became more interested in the colonial period itself. Her eventual focus on Koreans living in Japan and issues of citizenship and identity was a natural evolution, she says, especially given her experience as a naturalized American citizen living in Japan during an intensive Japanese-language program in Yokohama. “I saw high levels of cultural assimilation [by Koreans], but low levels of political assimilation,” Chung recalls. Koreans there were passing as Japanese in everyday life, using Japanese names and marrying Japanese at high rates, but because they weren’t citizens, they couldn’t vote or enjoy other privileges of citizenship. That struck her as interesting, particularly because more than 90 percent of Koreans living in Japan were born there. More interesting to Chung was her observation—during her dissertation work at Northwestern University—of the rise of movements within Japan to give Koreans partial citizenship rights, including local voting privileges. “New generations of Korean activists are using their foreign citizenship status to gain political visibility and power,” she says. Koreans first began emigrating to Japan in large numbers after 1910—when Imperial Japan colonized Korea—either by choice or as conscripted laborers. “During the colonial period, Koreans were regarded as Japanese nationals, both in Korea and Japan,” Chung says. World War II ended Japan’s occupation of Korea, and the San Francisco Peace Treaty of 1952 formally declared Koreans in Japan aliens, she says. After the division of Korea into two countries, Koreans in Japan had the choice of citizenship in North or South Korea, or to naturalize as Japanese citizens—an option that at the time required total assimilation and a complete renouncement of their Korean background, Chung says. “There’s a history of strict requirements for naturalization in Japan,” she says, including adopting Japanese family and given names and going through often-exhaustive verifications of assimilation. Hence the country’s large number of non-citizens —“special permanent residents”—Koreans who came or were brought forcibly to Japan before World War II, as well as their descendants. “The rapid growth of the foreign community in the past two decades has presented Korean activists with the opportunity to shape public debate on immigrant incorporation, Japanese citizenship, and Japanese national identity,” Chung says. Such efforts have included fights for local voting rights, which Koreans have achieved in many areas. The New Komeito Party, a member of the country’s ruling coalition, has introduced a bill to the Diet—Japan’s national parliament—to grant special permanent residents the right to vote in all local elections. Conservative members of the Liberal Democratic Party are opposed to the bill and have countered with one that would ease naturalization procedures specifically for special permanent residents, requiring only a simple registration process. Both bills are currently under debate in the Diet. Citizenship in Japan means more than full voting rights. Citizens also have the right to run for public office, freedom from public-sector employment restrictions, and security from deportation. There are symbolic, practical, and material gains from citizenship, too, including fellowships and scholarships limited to Japanese nationals. Other signs that Koreans are exercising power and challenging authority: Recent movements (and lawsuits) by naturalized citizens to regain their Korean names and efforts to allow elderly Koreans to collect pensions under Japan’s nationalized pension system. After a decade-long campaign, Koreans were successful in having a fingerprinting requirement for foreign residents abolished (it was abolished for permanent residents in 1993 and for all foreigners in 2000). Koreans—in collaboration with other activists and local government officials—also have pushed for the abolishment of the nationality requirement for civil service jobs. Chung says even the language surrounding the debate is changing. The Japanese government uses the term kokuseki—nationality rather than citizenship—and calls its citizens nationals, or kokumin. The term for naturalization, kika, carries an assimilationist, submissive connotation, in which the person relinquishes his or her ethno-cultural identity. As they work to transform the naturalization process, Korean and Japanese activists alike have increasingly used the term shiminken o shutoku suru for the naturalization process, which implies active participation and an acquisition of rights, not a surrender. Chung says the activists are using a different term to refer to citizens, too: Shimin, or citizen, literally “people of the city” or “townspeople,” a change reflective of a desire to recognize a multicultural, multiethnic society based on community rather than state membership or cultural homogeneity. References to foreigners as “citizens” of their local communities are common among Japanese activists and have appeared in the Japanese press as well as local government documents. As Japan grapples with issues of multiculturalism, identity and citizenship, Chung’s colleagues say her research will be of great value to the field of comparative politics, important for what it says not only about Koreans in Japan, but about how citizenship policies affect political and cultural involvement. Chung, who came to Hopkins in July 2004, has already incorporated her research into courses she teaches on East Asian politics and comparative citizenship and immigration politics. Infusing her courses with her fresh approach to comparative politics is partly why her classes are in high demand and her students like and respect her tremendously, says Blyth, who helped hire her. “She’s a really smashing colleague,” he says. In hiring her, the faculty committee went a somewhat unconventional route, choosing to bring to the department a rising scholar recently out of graduate school for an endowed professorship when they could have hired a more established one at the level of full professor. “She came through and so impressed everybody with not only her intelligence and energy but also with the breadth of her interests, that we decided unanimously to hire her,” says Political Science chair Matthew Crenson. Not so incidentally, Chung’s colleagues were also subsequently impressed by her ability to stay active in her field and barely miss a beat after giving birth to twins soon after her arrival. Early in the semester, as Chung readied her manuscript for publishers, she was already beginning her next project, comparing the participation of non-citizens in Japan and Europe. She also recently completed a paper examining the differences between Korean political engagement in Japan and the United States. In that paper, Chung argues that Korean-Americans who naturalized after World War II became more passive politically while non-citizens in Japan became more active.